→Hurriclean Review : Automatic Toilet Cleaner – Does It Really Work? When it comes to cleaning the toilets regularly and keeping them spick and span, we all are really too laid back, aren’t we?Cleaning the toilet and wash basin is like an uphill task that requires loads of time and effort and seems quite dirty too. Is there no option that helps you to do this same job in the quickest possible time and minimum effort? There is, and it is called HurriClean– automatic toilet cleaner. In this Hurriclean Review 2019 post, we will discuss every important thing about this product. You must have guessed it already, that HurriClean is a tool that empowers you to clean up fast and easy, without having to spend a lot of time and energy. This hurriclean as seen on TV is a pour-in cleaner for toilets, tanks and wash basins. 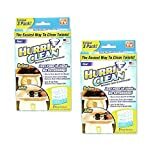 The manufacturer claims that you can use HurriClean to remove stains and dirt that is present in the toilet and turn it all sparkly and clean in a jiffy. The official website of this product is hurriclean.com. HurriClean is unlike other toilet cleaners because it is available in a packet meant for one-time use only. As per the commercials of hurriclean , this product is made up of a formula that consists of washing soda and real acids extracted from fruits. This unique formula is the most effective attribute of this product, which helps to sanitize and detoxify your toilet and septic tanks efficiently. HurriClean is a toilet cleaning powder that you can use one time only, per packet. Here are the steps for you to use it. Then after allowing sufficient time for the chemicals in it to react, all that you will need to do it flush the tank. No scrubbing and no scotching, the tank and toilet bowl will be so clean that they will sparkle. And not just superficially, but as the manufacturer asserts, HurriClean also eliminates bacteria and fungi and helps to maintain hygiene. If you find that the cleaning has not been effective for the first time, then you will need to allow some more time for the powder to soak in the tank. This product commercials, also asserts that you can use 3 packets at once too, but that will depend on the kind of stains that you want to fight against. It can efficiently clean up and sanitize toilets and tanks to make them free of stains and dirt. You can expect your toilet to become sparkly clean by using HurriClean. Pouring it into the tank and then flushing it will clean the tank as well as the toilet bowl. It also sanitizes the jet stream. HurriClean not only makes your toilet and septic tank sparkly clean, but it also fights against the most stubborn bacteria and fungi to prevent their growth. You can get rid of harmful bacteria, fungus, mold, and mildew and make sure that everything is clean and safe – that there will be no health hazards. If you have hard water in the area that you reside, then stains due to high mineral content in hard water must also be a very common occurrence. As per the manufacturers, HurriClean is excellent for removing such iron stains and deposits, which result from hard water. This product is itself safe to use in septic tanks as well, and it also does not contain phosphorus or any of its compounds. So you can use this product without the slightest worries about jeopardizing the health of your family. While it is common that cleaning and sanitizing solutions are accompanied by a typical smell, the HurriClean is different because it has no odour. Different people have different levels of tolerance when it comes to fragrances too, and what is a mild smell to some might seem too strong to another. To make it completely tolerant for all, there is no fragrance added to HurriClean. HurriClean has garnered hundreds of reviews from customers, which you can always look up on the Internet. Going through reviews it will help in forming the exact idea about the product instead of simply relying on its tv commercial. Those who have used HurriClean have expressed a lot of positive feedback about this product. Let us take a look at them. Most of the hurriclean review have expressed great appreciation for keeping the provision of a 60-day money back offers by the manufacturer. Users have said that this scheme can be the major crowd puller since people can then safely try the product without the fear of losing money to a scam. User reviews have also stated that they have fetched remarkable results using the Hurriclean. It is a safe and quick solution as compared to many other toilet cleaners which are ineffective even after long trials. The pricing of HurriClean is also very reasonable and also its overall performance is very good. However, they have put in a word of suggestion for those who are looking to buy. They feel that it is always more cost-effective to look out for schemes and deals that are launched on the original website from time to time, for lower prices of HurriClean. Alongside the opinions of the happy customers, there are many who are not that impressed with HurriClean. Several review has also indicated that Hurriclean did not work as excellently as it is portrayed in the TV commercials. Although it is safe to use and comes with not repulsive or strong smell, the action of this toilet cleaner solution was not very effective in removing stains absolutely. 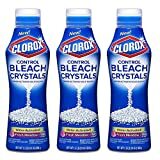 Water-Activated Solid Bleach,For Standard & HE Machines,Clorox Control Bleach CrystalsTM start working when mixed with water. It is always the best to set realistic expectations, even though hurriclean TV commercial, might offer a near-perfect impression. But compared to the price point and the safety of use as well as its decent performance as a pour-in toilet cleaning agent, the HurriClean does not perform too badly. You can always check out the cheaper alternatives, though there are not many that you can find. HurriClean is definitely worth trying out to see how much it suits your purpose. After reading our Hurriclean Reviews what do you think about this product? Whether it is important to you or not. Please do share your reviews in our comment section. Easy to use! Simply pour one powder packet into the toilet tank, no scrubbing need. Hurriclean does the nasty work for you using a powerful cyclonic foaming action that removes buildup, scum and rust marks. Super powerful! After six hours, flush your toilet, Hurriclean helps eliminate hard water mineral deposits, rings, stains, and odors from your toilet tank. Improves flushing and helps clean water jets for better flow. Very safe! Hurriclean won't harm the toilet, plumbing, or the septic system. Chlorine and phosphate free. Stops mold, mildew, and bacteria while leaving a fresh appearance. Hands free! No personal mess to worry about because using Hurriclean is effortless, simple, and efficient. Excellent Value! Each box contains 3-packets of Hurriclean, so a single pack provides 3-6 months of cleaning power! Cleaning toilets are really very unpleasant work, so I m personally recommending you to go with this product. The production efficiency is average still, you can go with it because its price is not too high.